Can I collect multiple kinds of veterans' benefits to pay for a nursing home? While the Department of Veterans Affairs (VA) provides a number of different benefits to disabled or elderly seniors who have served in the military, there are restrictions on how and when they may be used. Veterans’ Aid and Attendance is the most common benefit used to pay for long-term care. It can help offset the costs of intermediate nursing facilities, mental health hospitals, and home health care for seniors who need daily personal care. Veterans who have suffered a disability during active military service are entitled to monthly benefits based on their disability rating (between 10 percent and 100 percent). Once they collect this benefit, veterans who require daily help with personal care can apply for extended benefits to pay for nurse visits or in-home caretakers. Low-income veterans who actively served during wartime can receive monthly payments called a Veteran’s Pension. However, this can only be collected if you are 65 or older, or totally and permanently disabled, receiving Social Security benefits, or are currently living in a skilled nursing facility. Veterans who receive a VA Pension can get an additional amount from the VA if they are bedridden or are significantly restricted to their homes due to permanent disability. Veterans should pay careful attention to their benefit eligibility, as many funds do not allow “double dipping” (paying for the same services with multiple payments). 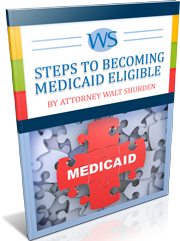 In addition, seniors may face a wait time of five years after they apply for Veterans’ Aid to get Medicaid benefits, as there is a limitation on trust creation (called “gifting”) to qualify for Medicaid. An elder law attorney can help determine your eligibility and wait time for benefits, including setting up trusts as soon as possible to avoid future waiting times—and if you are already in a nursing home, we can help you apply for additional benefits so that you can move to a better facility. Contact us today at 877-241-1230, or email to have our staff contact you.